The Sahel and Horn of Africa regions face mounting developmental challenges. Environmental deterioration has made the situation worse. 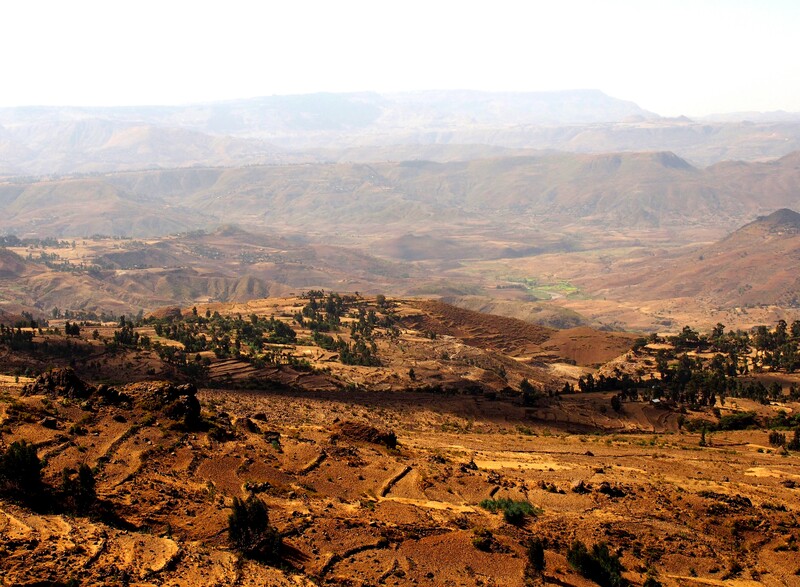 The major part of the region is desert or dry lands and most of it is estimated to be degraded. Additionally, the region has been affected by frequent and severe droughts in recent years. The recent climate change is likely to make desertification even worse. As people on low incomes in the region heavily depend on natural resources, persistent drought has further worsened their livelihood condition. The poverty in the region could further exacerbate insecurity and the increase of refugees. Addressing desertification properly and strengthening resilience to climate change are keys to making nations of the region achieve sustainable development while contributing to peace and stability in the region and globally. The 2030 Agenda for a Sustainable Development pledge that promises that no one will be left behind cannot be achieved without the sustainable growth of the region. Despite of its importance and urgency, the issues of droughts and desertification have not been given sufficient international attention and therefore, adequate financing for addressing those issues has not been mobilized. The priority of desertification and drought needs to be raised in the development agenda in African countries. Against this backdrop, the Government of Kenya, the Government of Senegal, JICA, and the UNCCD with partner African countries and development partners officially announced the launch of the initiative at TICAD VI in Nairobi in August 2016. They agreed to work together to combat desertification for achieving the SDGs in the Sahel and Horn of Africa, contributing to mitigating poverty, and to greater peace and stability in the region and the world at large. To contribute to making nations and communities resilient to climate change by promoting measures for combating desertification in the Sahel and Horn of Africa. Access to available international development finance is improved to promote measures for combating desertification in the region. Participating countries identified the challenges to be addressed and also good practices for addressing those, to combat desertification, land degradation and drought (DLDD), as shown in Table 1, in order to build resilient nations and communities. 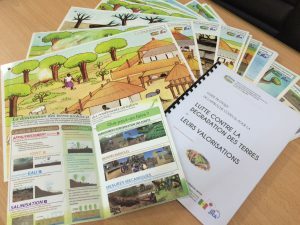 2 Land degradation, Deterioration, destruction and pollution • Rehabilitation and restoration of land through reforestation, afforestation and land protection techniques. The African Initiative is participated in by 7 countries in the Horn of Africa and 8 in the Sahel. Institutions and organizations involved in the Initiative in each country are those responsible for forestry, the environment, farming, agriculture and natural resources related sectors. 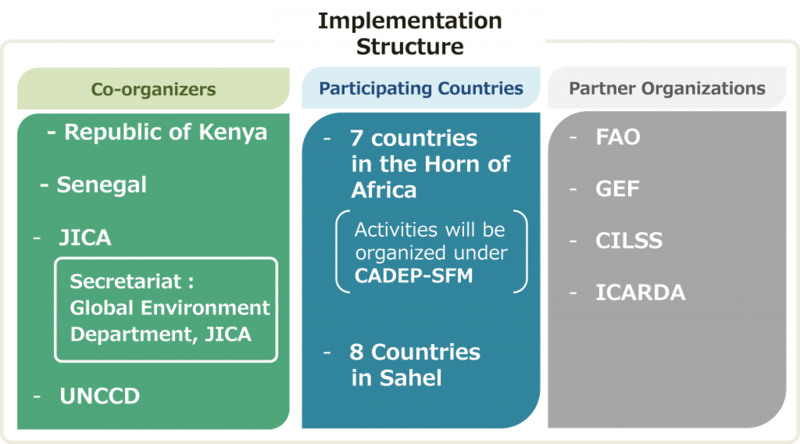 *For the implementation of the African Initiative in the Horn of Africa, the Government of Kenya, through the Ministry of the Environment and Natural Resources and the Kenya Forestry Research Institute (KEFRI), in collaboration with JICA, shall organize various activities under the “Capacity Development Project for Sustainable Forest Management in the Republic of Kenya” (CADEP-SFM). 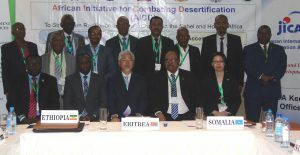 The African initiative for Combating Desertification is a non-legally binding and flexible frame work. Any organizations which have a will to work together for combating desertification in the Sahel and Horn of Africa are welcome to be a Partner Organization. Partner Organizations of the initiative are expected to contribute to the initiative by co-hosting workshops and events, sharing their expertise and experiences, and any other joint activities to accelerate the efforts for combating desertification in the region.